Jason gave the Cirrus Design team a run for their money with one of the most challenging paint schemes ever created for his custom aircraft. Ambitious. Jason had great ambitions for every aspect of becoming a Cirrus owner. “I was on a hell-bent mission to get my Private Pilot License. Driving back and forth 250 miles each way for business from the central coast of California to Los Angeles was too hard on my family and me. Flying became the only solution,” said Jason. In January 2015, he decided he would learn how to fly, but what plane would he buy? Jason laughed when recalling the story behind choosing Cirrus. “I was talking to my girlfriend about it, and she told me that celebrities owned and flew in Cirrus aircraft. I decided to do some research, and people were calling it the Lamborghini of small aircraft. I told myself that I might as well just buy the plane I know I’m going to want,” he explained. 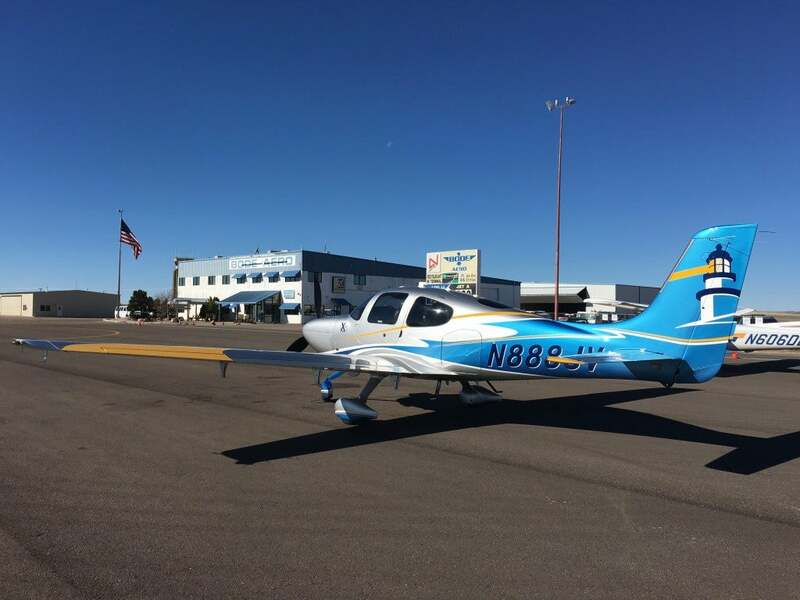 Good enough for the stars was good enough for Jason because he put a down payment on a fully loaded 2015 SR22T before even flying in one. 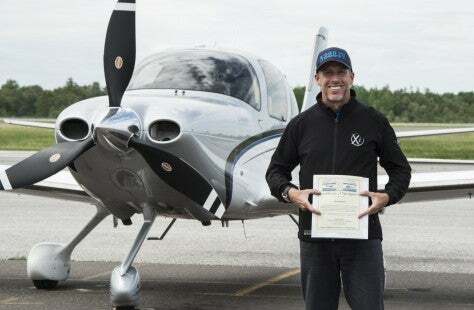 The decision to purchase his Cirrus right away gave Jason the unbreakable goal of cranking out training to get his Private Pilot License before taking delivery of the aircraft in July 2015. He had the plane, so he had to become a pilot. Jason earned his license while training at his local Cirrus Training Center (CTC), CalAir Aviation. “It was a crazy mission, but I accomplished it and had a great time doing it! When taking delivery of my aircraft, the factory training I received at Cirrus Corporate Headquarters was also unbelievable in the best way. Cirrus corporate pilot Peter Larson went with every kooky request I asked. I wanted true cross-country, mountain, high altitude and instrument flying. They told me the sky was the limit,” said Jason. This motivation gave Jason the additional goal of reaching Leadville Airport – North America’s highest altitude airport with an elevation of 9,927 feet. With oxygen masks on, Jason and Peter landed multiple times at Leadville. Learning about all of the advanced avionics in a Cirrus to become familiar, comfortable, confident and safe was very important to Jason. This extensive training gave him that confidence and an entirely new perspective on small aircraft. “If you had told me a year ago that I would be flying a plane, I would have said you’re insane! I was so scared of flying in a small aircraft. Now I feel far safer in the air with my Cirrus than on the ground surrounded by texting, distracted, dangerous drivers,” said Jason. To be even safer in the skies, Jason completed the Instrument Rating at CalAir Aviation. Now, Jason has over 300 hours flying in just nine months since his first flying lesson, and he sees his life as impossible without his Cirrus. The flexibility to see clients in another city and fly back in time to pick up his kids is amazing to him. That fact has made his Cirrus pay for itself countless times. “This summer I sent my son to camp, and being away for a few days, he was a train wreck. In the morning, I was able to fly and spend a few hours with him. I was back to work in time for a meeting in the afternoon. Doing that would have been impossible without my Cirrus. That ability to be there for my son was priceless,” he said. Owning a Cirrus has also impacted his business in remarkable ways, and Jason’s relationships with his clients have never been better. “I had a client that moved from San Francisco, California to Reno, Nevada, and instead of sending the documents to him via FedEx, I decided to fly out to drop them off in person. It meant the world to him,” Jason remarked. His Cirrus gives him the best of both worlds – being a champion at work and at home. Though, he’s run into an interesting problem. Jason has to add at least 20 to 30 minutes when he travels somewhere new. Why? With the brilliant colors and unique design of his Cirrus, Jason has people walking up unexpectedly to marvel over the aircraft and ask him questions. Needless to say, he is more than happy to accommodate extra time for others to check out his aircraft – or flying Cirrus billboard as Jason says. He’s a true advocate of the Cirrus Life and doesn’t plan on leaving it. “I’m the type of person who usually outgrows possessions, always wanting something newer and better. I won’t outgrow my Cirrus. This is it,” finished Jason. 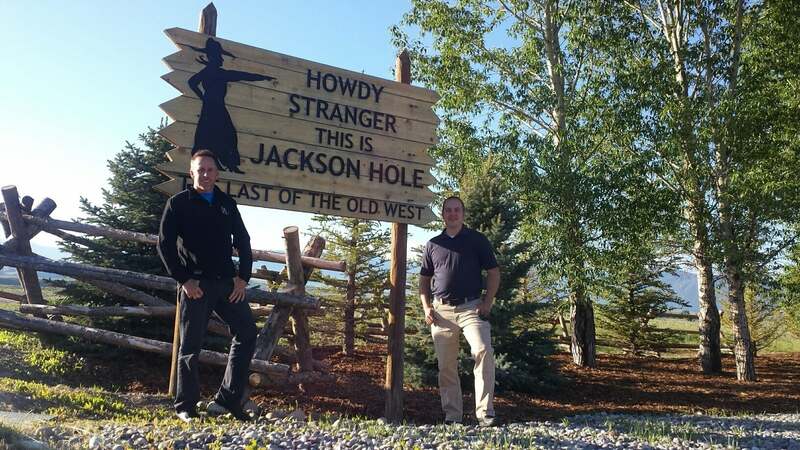 Top: Jason and Peter at a stop in Jackson Hole, Wyoming. Bottom: Jason’s custom designed Xi SR22T. Jason, what a fantastic paint scheme. Congratulations and best of luck. Can’t wait to see it in person!